‘Tis the season! Of chapped lips and dry cheeks. All of my children have been complaining about dry lips and have been asking for lip balm. I’ve been reading some negative things about over-the-counter chapstick though, like the use of ingredients such as petroleum jelly / petrolatum (vaseline) and parabens. Things I don’t want my kids to get into their little bodies. So we decided to try to make our own homemade natural lip balm. Which turned out to be super easy and fun to do too! The result is really nice. The balm has the right, soothing consistency and because of the peppermint, it has a nice, tingling and fresh feel to it. Now we have the hang of it, we will be experimenting more. For example, I like the idea of using orange and cinnamon for this time of year. And I would love to try to work with apricot or almond oil. But this peppermint balm is a good, basic recipe to start with. Put the beeswax, the shea butter and the coconut oil in a (mason) jar and heat au-bain-marie until it is all melted. Remove the jar from the pan and stir in the vitamin E oil and about 20 drops of the peppermint essential oil. (A chop stick works nicely for the stirring.) 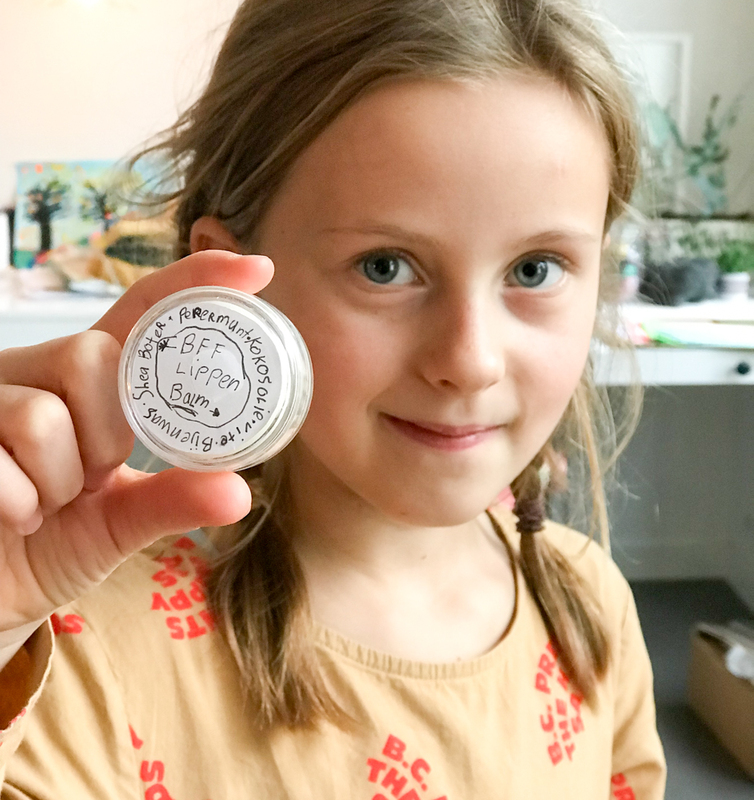 Let a drop of the balm fall on a cold surface (for example a saucer), and once it’s cooled down and set, test the balm on your lips to see if you feel it is quite minty enough. Add more of the essential oil if you feel it needs it. We ended up using almost 40 drops! Using a small funnel, pour the balm into the containers. Let cool (which goes quickly) and close. And design a lovely label, so they make a nice (BFF) gift!